About a week ago, I ran across a discussion about writing plug-ins for Carrara to develop more advanced features. That sparked a memory (in itself a true miracle!) about the PyCarrara plug-in. I had looked into the plug-in just after buying Carrara, and then set it aside, mostly because I did not have enough knowledge of Carrara at the time to understand what it was adding. Thanks, Jonstark, for getting me going again on this! Also, WendyCats had a discussion sometime earlier on using PyCarrara to do animation using sound. This past week I started sinking my teeth into the plug-in, and am (so far) really impressed with the capabilities. That of course got me wondering why others are not touting and demo'ing what it can do. I suspect it is a bit caused by minimal publicity of the tool (can anything FREE be GOOD?) and that most people don't want to actually write code to do animation. But coming from POV-Ray to Carrara, where EVERYTHING is coded, that did not dent my enthusiasm. I am starting this thread in hopes of sharing what I am discovering about this amazing little plug-in, and to provide some insights, ideas, and even some PyCarrara script (code) to help others explore this area. I sincerely hope others who have some experience using this plug-in will offer their thoughts and experiences as well! Having not ever written in Python, I thought I should start by just testing the waters with the plug-in, so I chose to study the plug-in's tweener addition. This first post is about my first exploration into that feature. NOTE: While some of these tweener animations don't look like anything different than what Carrara already provides, keep in mind that scripted tweeners are limited only by your programming skills. I discuss more of this in my document. And finally, you can download ALL .CAR files used in creating the YouTube demo, as well as the Python tweener scripts by clicking on this link. NOTE: TO DOWNLOAD THE FULL SET OF FILES THAT SHOW, CLICK CTRL-S. I hope you'll take the time to watch the 5 minute video. Of course, I am always interested in feedback and comments, so share your thoughts, opinions, knowledge, and experiences! Until someone creates a Macintosh version of PyCarrara, I don't feel that it's a viable platform for Carrara plugin creation. Everything written in PyCarrara will be for Windows only and will foster an inequality between Mac and Windows Carrara users. I would rather see a campaign to bring PyCarrara to the Mac platform than see a lot of effort put into making Windows only PyCarrara apps. In almost every PyCarrara thread, someone voices the opinion that there needs to be a Macintosh version, but it seemingly falls on deaf ears. I don't want to throw cold water on this thread, but I would really like to see someone with some programming chops take up the cause and try to get this working in the Mac version of Carrara. It has great potential to be a valuable extension to both versions of Carrara. What are the obstacles preventing the release of a Macintosh version? I know that you have stated that you do not own a Mac, but isn't there someone in the Macintosh user community who could assist with that portion of the project? With other programmers starting to create plugins based on PyCarrara, I'm sure a Mac version would be very appreciated. With PyCarrara 1.0 I have removed almost all Windows specific code. I think that the port should now be quite easy. Any volunteer for the job ? I think he was basically offering anyone the option to do this. So I wouldn't say it fell on deaf ears. He did the upfront work; someone just needs to follow through on it. BTW, I agree that there should be a Mac version. But I can't say I blame Frederic, as he is giving the utility free. And not to disrespect the Mac platform or you, any tool I can use that makes my job of creating animation easier or better is a viable option for me. Thanks for the documentation and video demo . pleased to get my hands on anything that helps me understand this plugin which so far has been beyond me. I totally agree with you. Everyone should take advantage of any tool available to them. I'm just trying to shake the tree again, in hopes that a programmer will fall out. The Carrara forum probably doesn't have many members who are programmers capable of porting PyCarrara to the Mac. Frederic might have more connections to other programmers than any of us "users", and since he is the originator of PyCarrara, I had hoped he would spearhead an effort to find one. Precisely why I started this thread. Loading the scripts I provided, reading the behavior they create, and "fiddling" with the scripts and demos provided may help. I also hope users will post questions or issues about the plug-in on this thread. So if you get stuck, post something here. I am now looking at the PyModifier component of the plug-in, and hope to have some example scripts on that in the next few weeks. You might try by posting a challenge there to see if someone of Fenric's calibre would be willing to do it. You will need to source code, which I have not been able to put my hands on. That means getting Frederic to release it for use. May I suggest that you please post updates to this on this thread? I'd like to know what is happening on that front! I am very happy to see all this activity around PyCarrara ! PyCarrara source code is available from here: http://sourceforge.net/p/pycarrara/code/HEAD/tree/trunk/ and is waiting for volunteers. If someone want to contribute with Mac version, I will take time to provide with support about the software internal architecture. I have several mods I want to consider for this, so I'll be downloading it. We do seriously need a Mac volunteer to see about porting the source to the Mac platform! I am first and foremost a programmer with a long list of languages tucked away in the c.v. However a little rusty after concentrating so much on learning Carrara and only being given rudimentary web programming and design contracts for the last 4 years. Anyway, I'm stuck on a problem which I'd like to use pycarrara to fix (or at least see what I can get up to here). Trouble is I can't get off step 1! I can install python ok, but any scene files I load say that python 2.6 is missing. I search for an old version of 2.6 and installed it but the same two error messages come up when loading example files (see attached screenshots). I am using Windows vista 64 bit and have downloaded a 64-bit python executable. I confirm that pyCarrara it's self seems to be ok because I can find both pymodifier and pytweener. Can anyone help please? I'm sure I'll be useful to the cause once I get going as I have a habit of making tutorials after solving a problem. There was mention in another thread (PySwarm, I think), that says you need to put the files into Extensions > Plugins, rather than just Extensions, like most others. I think that's right. Did you already see this link of Fractal Dimensia? 1) Use the version of Python Frederic suggests - Version 2.6.6. There should be a download link in the guide. If not, you can find the link in the wiki page DUDU referenced above. I think there is a message referring to the type of CPU, but you can ignore that. It works fine with Intel processors. 2) You can test to see if Python is installed. You should have a folder (something like) "c:/python26". In there should be an application called "python". 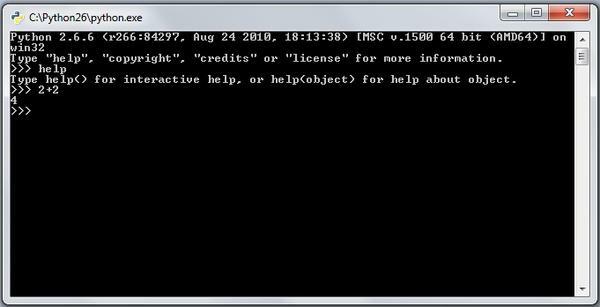 Opening that will bring up the interpreter command line. (See screenshot below.) Type something like "2+2" and verify the interpreter is working. If you've gotten this far, then the problem is most likely in the plug-in installation. 3) Make sure you have PyCarrara V1.0. There are still some earlier versions floating around in ether-land, so make sure you have the latest. Again, the wiki page referenced above will point you there. 4) There are 4 folders in PyCarrara zip file. You will only need either C8_Win32 or C8_x64. As mentioned above, the location is critical. 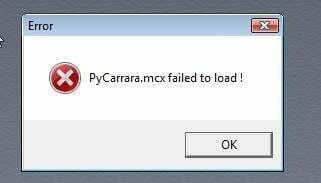 Some files go into the Extension folder - PyCarrara.dat, PyCarrara.mcx, and PyCarrara.txt. PyCarrara.py should go in a subfolder of Extension called "plugins". Thanks man. I'm going to attempt this when I next get my machines rendering. With any luck later today.